The first record of a church at Bunbury comes from around 755 AD. That early building was constructed of wood, but we know that a church existed on the site in 1086 when it was mentioned in the Domesday Book. The first stone church that we know of dates to 1135, but this was replaced by the current building in 1320. In 1385 Sir Hugh de Calveley endowed a college of priests at Bunbury. 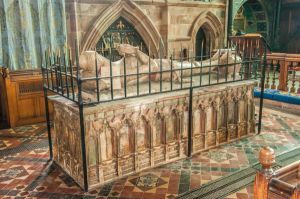 Sir Hugh's ornate tomb chest stands in the centre of the chancel, surmounted by a wonderfully carved effigy of the knight in armour. 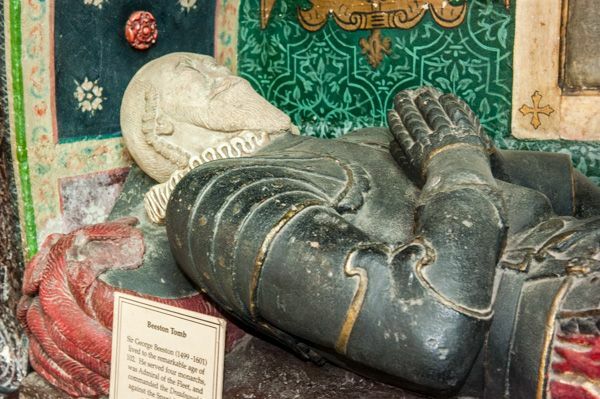 Sir Hugh was a true giant of a man; he may have stood almost 7 feet tall if we are to believe historical records. 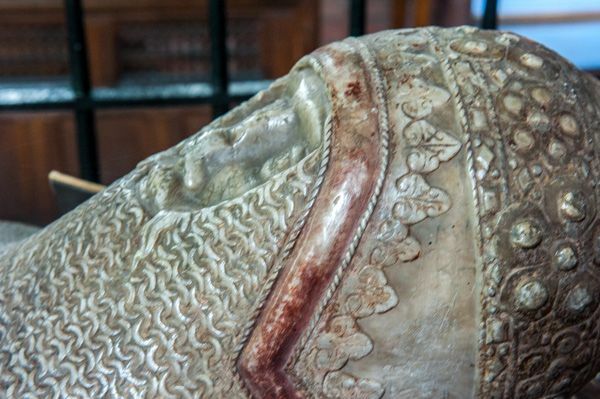 His tomb is the earliest alabaster monument in Cheshire. 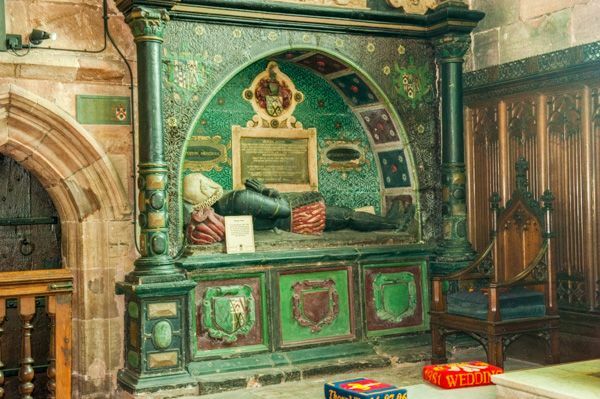 Notice the graffiti carved on the tomb; this is not due to the excesses of modern youth but was inflicted by Civil War prisoners held in the church. 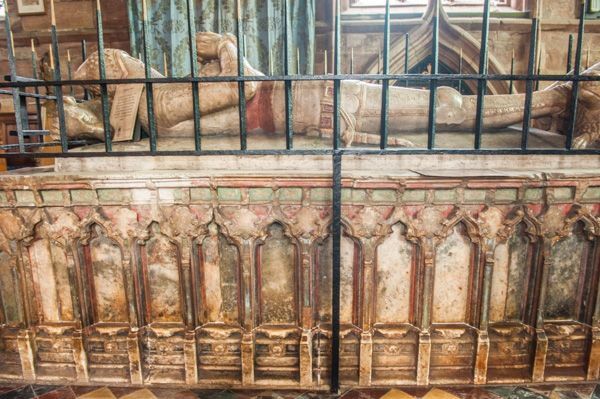 As impressive as Calveley's tomb is, it is outshone by its near neighbour, for within the chancel rail, set against the north wall of the sanctuary, is a fabulous wall monument to Sir George Beeston. This ornate tomb has been restored to its original colours and is truly astonishing, a symphony of green and gold. Sir George commanded part of the English fleet against the Spanish Armada, and also served as Admiral of the Fleet. Also within the sanctuary is a 14th-century sedilia and double piscina. Beside the chancel is the 16th century Ridley Chapel, erected by Sir Raufe Egerton. This is separated from the chancel by a wonderfully carved stone screen. The nave was remodelled in 1490, and as a result, it presents a very different feel than the older chancel. The nave seems light and spacious, with tall, slender pillars reaching up towards the heavens. 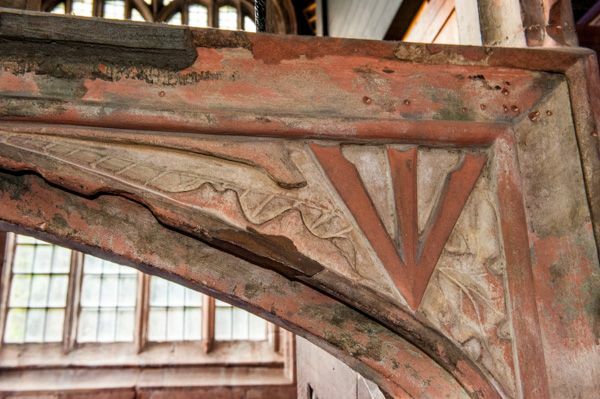 The roof is punctuated with angel figures bearing coats of arms of prominent local families including the Calveleys, Beestons, and Egertons. In the north aisle is a 14th century stone reredos carved with fanciful figures, including a Green Man, thought to symbolise rebirth and fertility. At the west end of the aisle is a large memorial to Jane Johnson (d. 1741). This was apparently buried near the altar by a previous rector who was disturbed by the prominent bosom of the effigy! On the wall of the south aisle are a series of painted panels rescued from medieval parclose screens. These were restored by artisans at the Victoria and Albert Museum. Bunbury's chantries were dissolved in the Reformation, and in 1548 the church reverted to the crown. 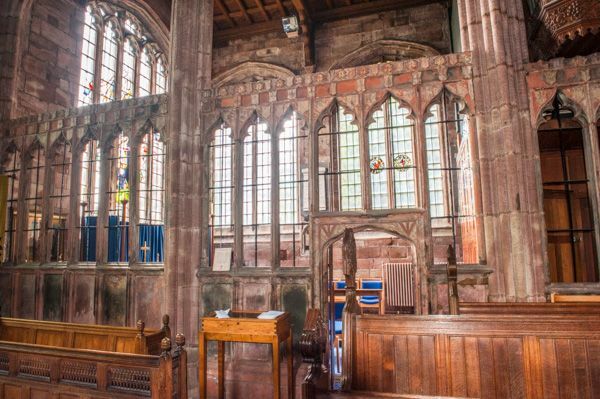 The spotlight of history fell on Bunbury in 1642 when the magnates of Cheshire met in St Boniface church for the so-called 'Bunbury Convention', where they declared the county of Cheshire to be neutral in the conflict between Parliament and the king. That neutrality did not stand the test of time, and in the following year, the church received heavy damage from Royalist fire. 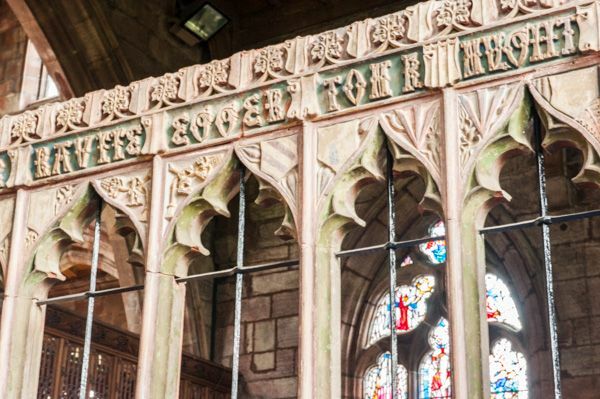 We really enjoyed Bunbury's church; the fabulous tombs in the chancel were the highlight for me, and the Ridley Chapel screen is simply wonderful.